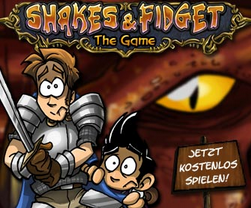 Shakes & Fidget is a popular German web comic that parodies World of Warcraft and other fantasy MMORPGs. Now fans can explore a simple browser RPG based on the Shakes & Fidget concept. The game uses a pretty standard script found in games like Gladiatus and Tanoth where players complete quests and ‘work’ by waiting for timers to complete. The unique, humorous art style helps the game stand out, and competitive arena battles between players act as the main gameplay hook. Shakes & Fidget is a 2D browser RPG based on the web comic of the same name. The game has a distinct cartoon art style and gameplay that mainly involves PvP battles in the arena.Players can chose from eight races and three classes.